Built from ABS plastic, for great durability, with chrome effect rim and your choice of solid body colours. Built from ABS plastic, for great durability, with chrome effect rim andŒæhigh chrome coating. 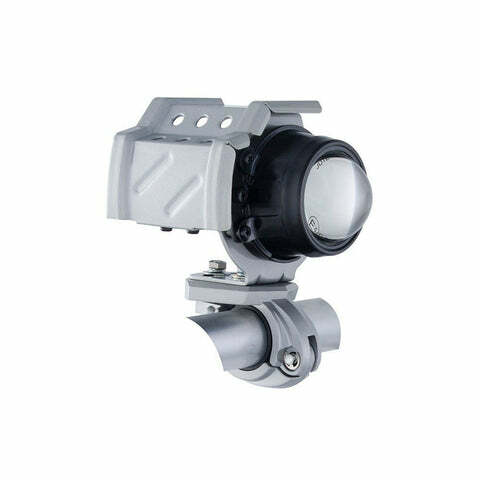 The Bike-it Adventure touring projector headlight is a high quality 80mm 12V light unit, that can be fitted universally to any bike, whether its for touring or green laning; plus it's 100% waterproof body means it'll keep going no matter what. Using a H8 12V 35W bulb for ultimate visibility. 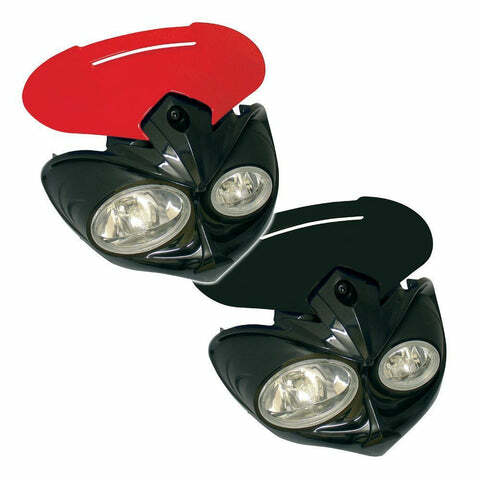 Comes with mounting bracket, and 3 rubber inserts to fit to different size bars and can be placed on engine guards aswell, with the Hi-Beam model designed for the right side of your bike and the Low-Beam model for the left side; to keep with UK road laws. High chrome Bates headlights visors are a neat custom add on for the round headlights, especially popular on classic style bikes. 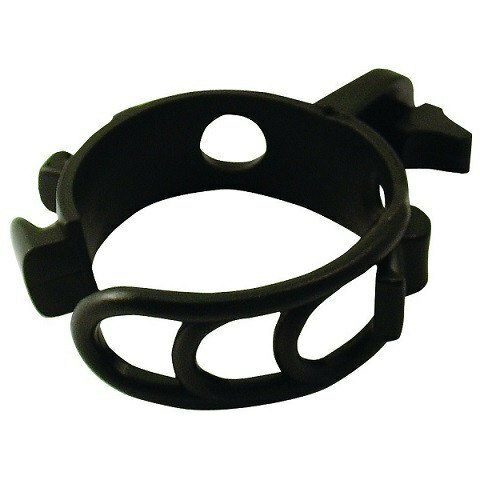 Simply locates between the housing-rim and glass deflector, and fits securely. 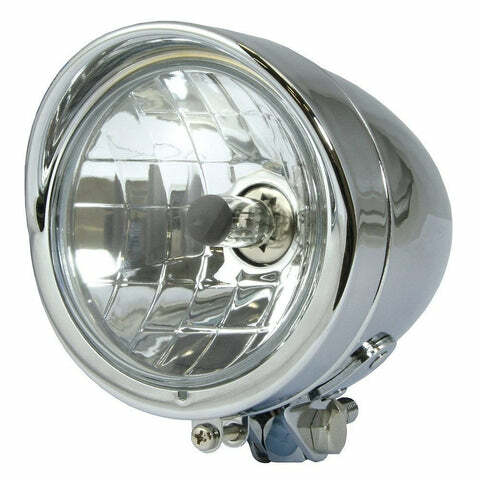 Bates headlights are a popular choice for any headlight replacement or classic bike restoration projects, thanks to their reliability, durability and great value for money. 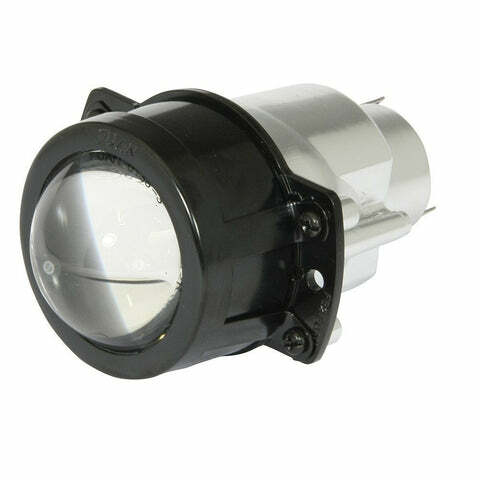 The European spec models feature rightŒædipped lenses for European roads only (UK models can be found here), and utilise a H4 12V 60/55w bulb, plus a 12V 5w side light bulb. 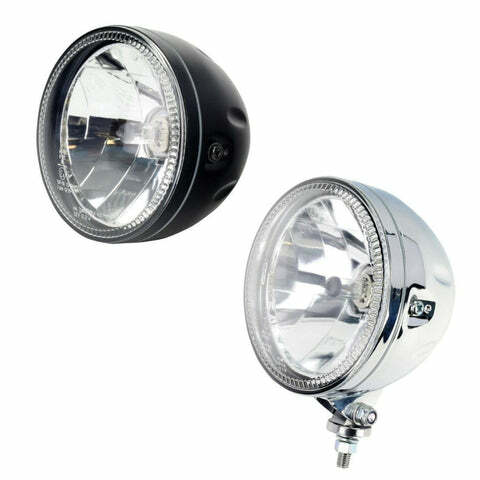 The UK spec models feature left dipped lenses for UK roads only (European models can be found here), and utilise a H4 12V 60/55w bulb, plus a 12V 5w side light bulb. 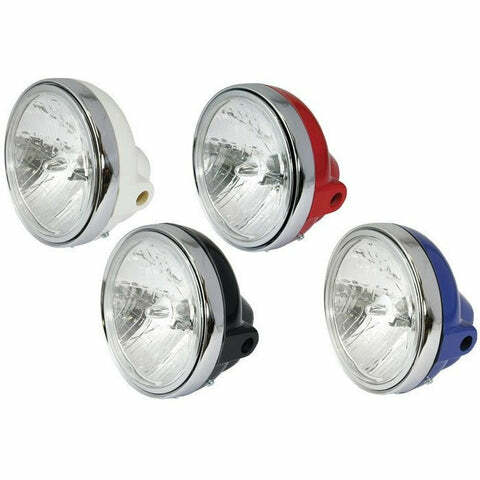 Universal Bullet headlight makes a cool addition to any bike front end, with it's bottom mount making it easy to fit anywhere on your bike. 4 1/2" diameter, with H4 bulb and centre dipped beam, plus a chrome body. 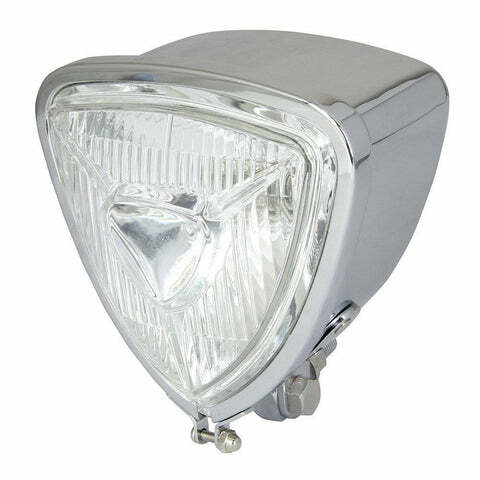 Universal chrome headlight, in a triangle shaped lens and body featuring a H6 12v 35/35w bulb and centre dipped lens. Adjustable bottom mount makes it simple to fit to any bike and in any position you want to. 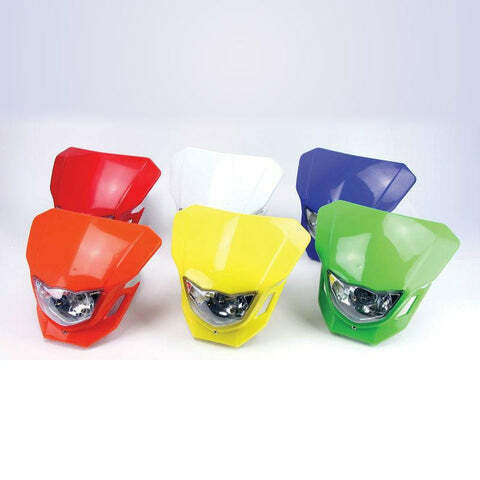 Universal fitting Dart headlight with single 12V 35W bulb, and seperate 12V 5W sidelight. Supplied with 4 x rubber fork-mounting brackets. Everything you need to simply update the look of the front of any bike! 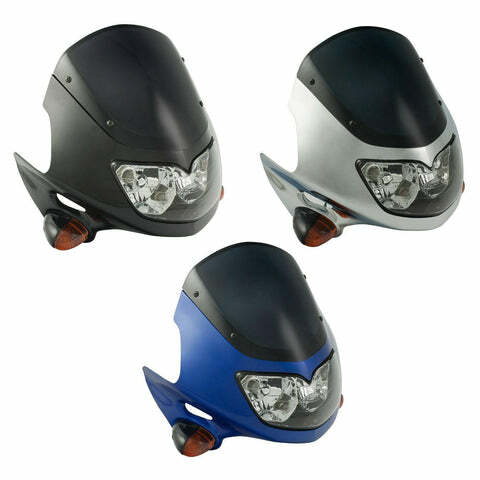 The Dash sports fairing headlight is a universal fitting unit with an integrated, smoked low-screen. 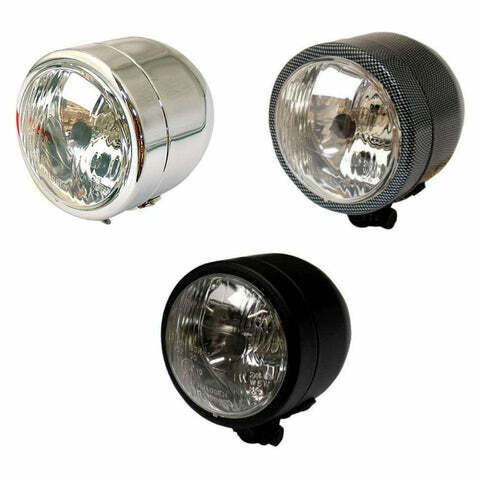 Features a twin headlight with 12v 35w bulbs, and in-built indicators, plus two extra sets of anodised reflector stems. A simple way to change the look of your bike's front end with minimal installation work. 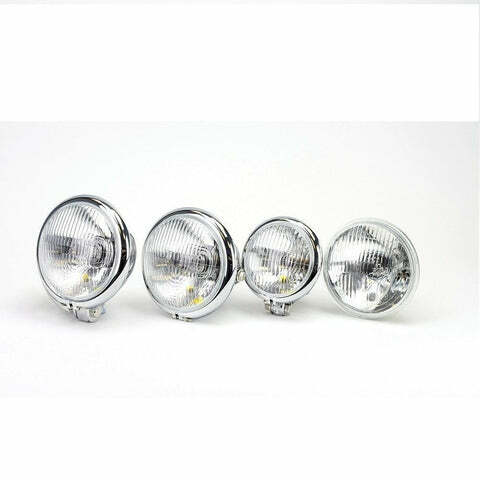 A neat style of twin headlights (12V 25/25W) with integrated indicators and a smoked effect fly screen, to make this an all rounder for style and performance. Fits universally using standard headlight brackets (fitting kit not supplied). Perfect for a streetfighter project, or any custom build, giving the front end of your bike an aggressive look. The 3.5" diameter headlights feature H4 12V 60/55w bulbs meaning you can light up the road ahead without breaking the bank! E-Marked, with centre dipped beams. 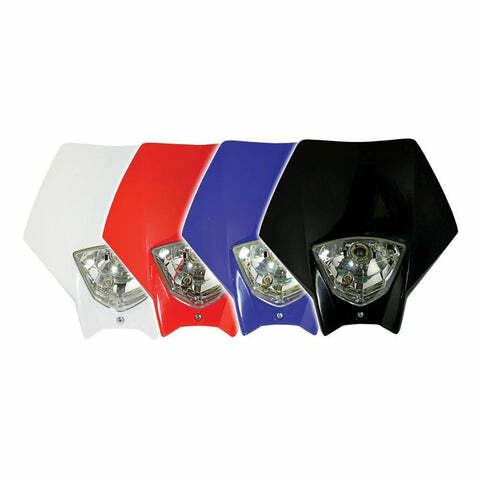 Fully E-Marked universal Falcon fairing headlight unit, featuring a H3 12V 55w bulb for ultimate visibility. Plus custom styling and integrated low height screen, make this a simple but effective upgrade for any bike, or streetfighter project. 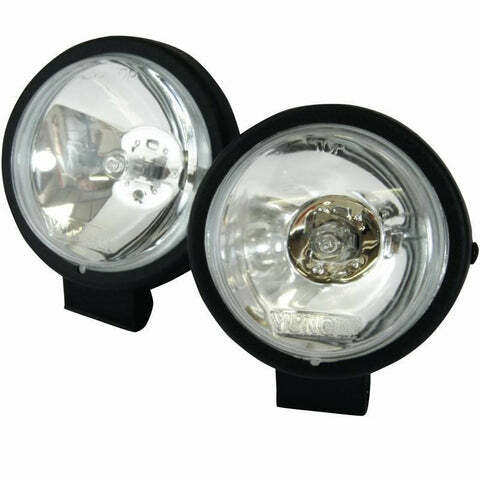 The Halo headlight units are a cool 5 3/4" round light with an alloy body and rim, featuring a H4 60/55w headlight build, and white LED 'Halo' ring. The perfect addition to any custom street bike, with a unique appeal and practical headlight alternative. Hi Beam & Low Beam integrated. 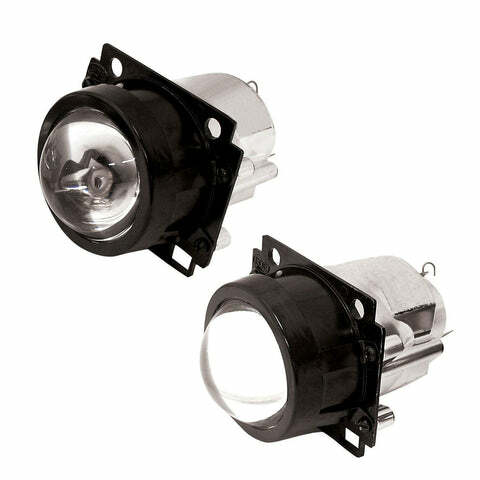 Halogen Fog lights are an easy to fit add-on for any motorcycle using their bottom bolt mounts (brackets required). 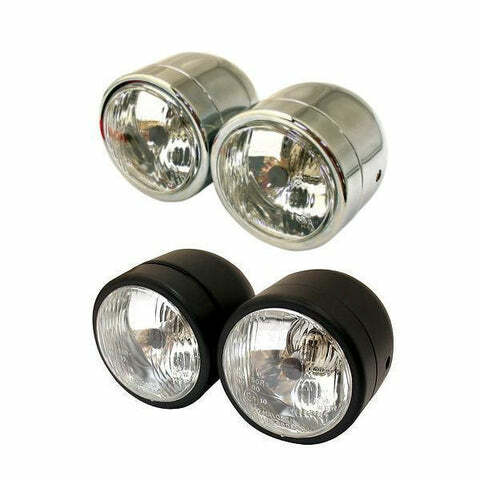 Supplied with H3 12V bulbs, sold in pairs. 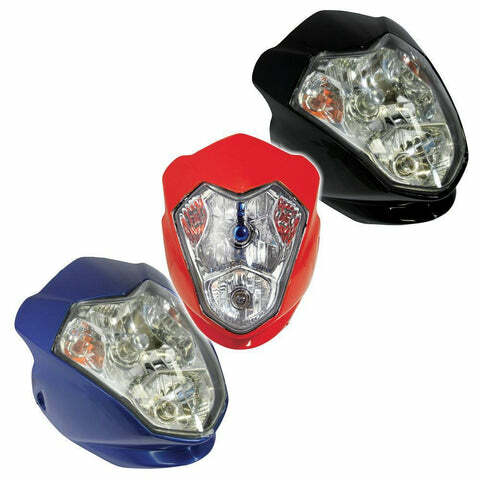 The Raider fairing headlight is a simple to install universally fitting headlight unit featuring a practical 12v 35/35w bulb and seperate 12v 5w side/parking light. Comes with four rubber mounting brackets for easy fitting to fork legs. 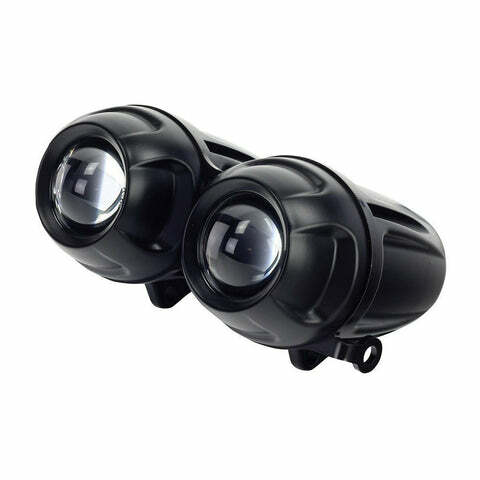 The Raptor II fairing headlight is a universal fitting unit with an integrated, darkælow-screen, featuring a twin headlight with 12v 35w bulbs, and in-built indicators. 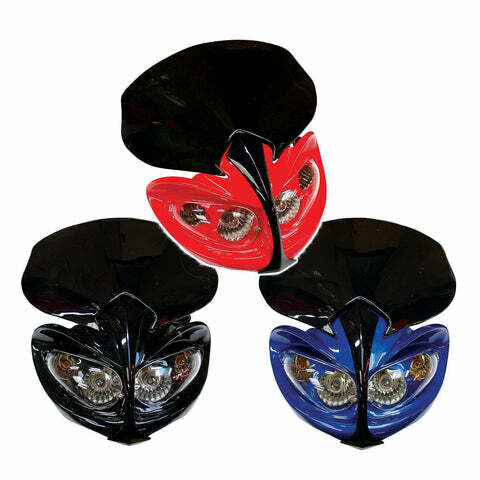 Dominator headlights are popular, thanks to their universal bottomŒæmounting bracket, meaning they can be fitted easily any where on your front end. Centre dipped beams. 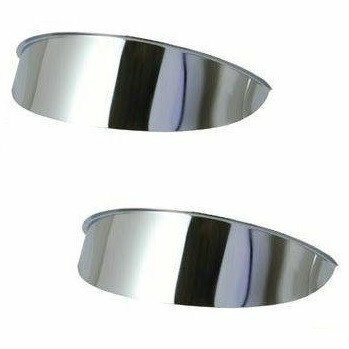 Replacement light units available. 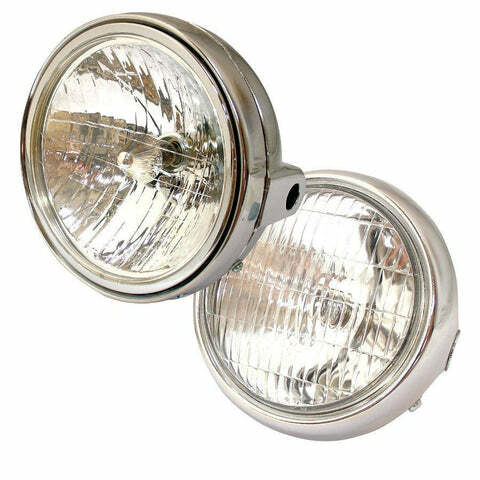 Need some universal headlights for your project or bike build? 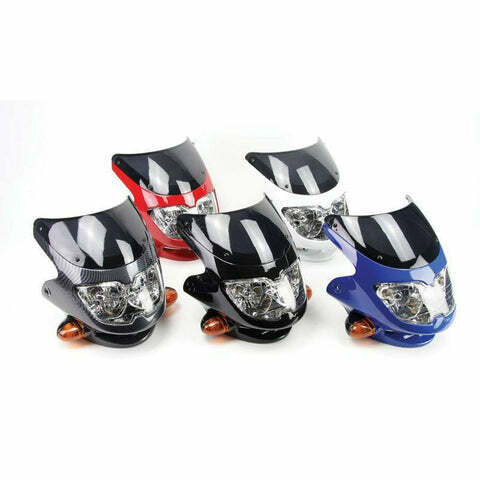 These projector headlights are very popular with custom, and special bike builders, due to their easy universal fitting, meaning they can be added to custom nose cones and front end units.